How can I keep the original file [commit] timestamp on Subversion? I want to be sure that if I commit something in Subversion from one machine, and I checkout on another, I will get the same value for datetime and timestamp. Currently, I observed that the datetime of file's modification is from the moment when I did the synchronisation instead of the original value. For me, it doesn't make any sense to know when the files were synchronised - I just want to see the last commit time. This issue is not timezone related. Although you will have strange side effects if we are talking about source files. For example, you build your software and do svn update. Now the timestamp of the updated files is older than the timestamp of the build result file, and it won't be rebuilt even though some source files changed. Be very careful with this setting. 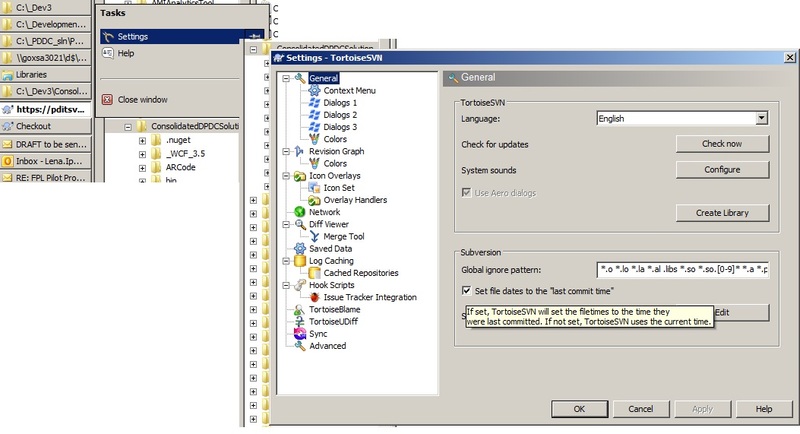 If you are using TortoiseSVN, there is an option. TortoiseSVN -> Settings -> General -> "Set file dates to the 'last commit time'". Subversion doesn't preserve the original timestamp of the file. If you absolutely need to preserve the timestamp, you have to do it yourself. For example, you could store the original timestamp as a Subversion property. It would seem 'stat -c %y $FILE' be used as part of a pre-revprop-change hook that operates on svn:date. Only issue I might see is the date format. Not the answer you're looking for? Browse other questions tagged svn datetime timestamp or ask your own question. How do I preserve files' timestamps using SVN? How can I keep original file timestamp when checking into subversion? How can I keep the file timestamp for import, commit, and update? Is there a way to reliably get automake to ignore timestamps? Subversion: prevent local modifications to one file from being committed? How to convert a unix timestamp (seconds since epoch) to Ruby DateTime?